Summers on Bainbridge Island are filled with adventure and fun, but it’s time to start turning our attention to the upcoming fall months. With schools in or nearly-in session across the country, many parents and caregivers are finding themselves thrust back into the hectic pace of day-to-day life. So this fall, treat yourself or your loved ones to something special, and come spend a few blissful nights at our award-winning Bed and Breakfast on Beautiful Bainbridge Island, just a short ferry ride away from Seattle, Washington. Fall on Bainbridge is simply magical. The temperatures are mild and enjoyable, and the colors around the sound change from green to the signature golden, fiery hues of autumn. When you stay at our quaint Bed and Breakfast, you’re part of our family. Come see what makes us different than our competitors. Book your room at the Eagle Harbor Inn today. Why Getaway to Our Bainbridge Island Bed and Breakfast? 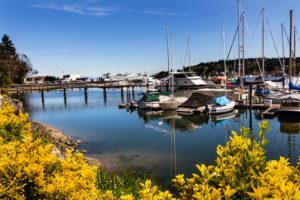 It’s true that there are plenty of wonderful places to stay in the greater Seattle area, but none quite match up with the luxury and elegance of the Eagle Harbor Inn. Instead of staying in the city, consider coming across the water and making the charming town of Bainbridge Island your home base. Our Inn sits in downtown Winslow, just off Bainbridge Island’s main thoroughfare through downtown. We’re located within easy walking distance of everything you need, including downtown Seattle. Inside the Inn, you’ll find luxurious suites, tastefully decorated and designed with your every need in mind. But we know that your stay is about more than the accommodations, and even the hospitality you’ll experience behind our doors. What you’ll find here is an experience; one that is reflective of beautiful Bainbridge Island itself. Our Bed and Breakfast is situated just minutes from all there is to enjoy in downtown Bainbridge Island, including fine dining, great shopping, plenty of art galleries and a museum, and the island’s surrounding parks, trails, and beaches. From here, your options are endless. One night, savor your time together and enjoy dinner at local favorite Restaurant Marché, followed by a show at Bainbridge Performing Arts, both walkable from our Bed and Breakfast. The following day, you can spend the day browsing downtown Winslow’s boutiques and the Bainbridge Island Museum of Art, home to some truly impressive local and regional art. Don’t forget to find your way into one or more of Winslow’s wine tasting rooms as well. Nature lovers won’t want to miss hiking through the Grand Forest, and strolling along the Waterfront Trail, before unwinding with a drink at Bainbridge Brewing Alehouse or The Harbor Public House. Plan a little escape this fall at our Washington Bed and Breakfast. You won’t regret it! Book your room today.